In 2009 the Swiss watch brand Alpina became the Official Timekeeper of the American races “12 Hours of Sebring”. The annual endurance race takes part at Sebring International Raceway (Florida State). “12 Hours of Sebring” is one the most important events in the world of motorsports. The Alpina Racing Collection was created within the partner agreement. The time indicators designed for the drivers meet all requirements: the highest level of accuracy, readability, shock resistance, sturdiness and reliability. The raised luminous indexes ensure visibility also during the nightly hours of the race. The 12-hour tachymeter scale on the inner side of bezel counts the race start and finish: it starts in the morning and finishes in the evening. The advanced technologies of the watch manufacture and high quality materials were used for the creation of time indicators. The Alpina 12 Hours of Sebring Automatic Chrono GMT (Ref. AL-725LBR5FBAR6) series were released in 2010. The model is based on the automatic caliber AL-725 (alternances – 28.800 a/h, power reserve – 42 hours). The round case of 47 mm diameter is crafted in polished steel with PVD treatment. The black dial is featured by multilayer system of indication: central hands, date, second time zone, chronograph function. The 12-hour chronograph counter at 6 hours allows you to trace the 12-hour race. The red “12” on the dial symbolizes the finish line. The frontal glass, made of sapphire crystal, is characterized by shock resistance. The leather strap with carbon treatment and contrast red stitched create a perfect appearance of the watches. The time indicators easily “adapt” to their owners’ wrists due to specially developed system of the strap sewing. The model is characterized by the water resistance up to 100 meter in depth. The limited edition includes 258 pieces. The Alpina Racing collection also includes the quartz chronographs (Ref. AL-352LBR5AR6, Ref. AL-352LBR5FBAR6) and automatic watches (Ref. AL-525BR5AES6, and Ref. AL-525LBR5FBAR6 and Ref. AL-525BR5FBAES6). Their design is similar to the one of aforementioned model, but they are inferior in functionality. The Alpina watch brand is very closely linked with the world of motorsports: it is also the partner of RLR motor Racing team, which takes part in the most famous race “24 hours of Le Mans”, in France. The endurance competition takes place at Sarte race track (13650 meters length). 50 cars of 4 classes take part in the race: Le Mans Prototypes, LMP – LMP1, LMP2 and Grand Touring, GT – GT1 and GT2. 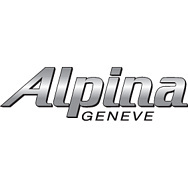 In 2011 the Swiss company Alpina launched a virtual races contest. The virtual Alpina Racing is carried on by iPads and iPhones. To take part in racing, you need to upload your game results from your module phones at the Alpina Game site. The points are summed up each month. The game represents a 3D race. The first winner of virtual competitions is Mikhail Sysoev, Moscow. He was awarded the Alpina wrist watch of 470$ cost at the special ceremony. The Swiss watch brand Alpina is the official Timekeeper of other kinds of sport too: downhill skiing, diving, personal watercrafts races.